Believe it or not, I started getting ready for winter this week. Yep. Usually, by the time winter rolls around, I am already sad and mopey and have trouble getting out of the house. So, it’s STILL August, and I am bringing fish oil back and shifting my workouts to earlier in the day (to account for when it’s going to get dark early). Chances are, there is a particular habit you are working on right now. It could be going to the gym regularly, taking your fish oil, quitting smoking, or not drinking more than twice a week. And, as the infamous 2009 iPhone commercial says: “There is an app for that!”. You may find it beneficial to use a habit-specific habit tracker – for example, there are few apps that are specifically geared towards reducing drinking, and others that are geared towards smoking cessation. I prefer to specialize as little as possible, and use universal tools instead (which is why I keep everything in Evernote!). 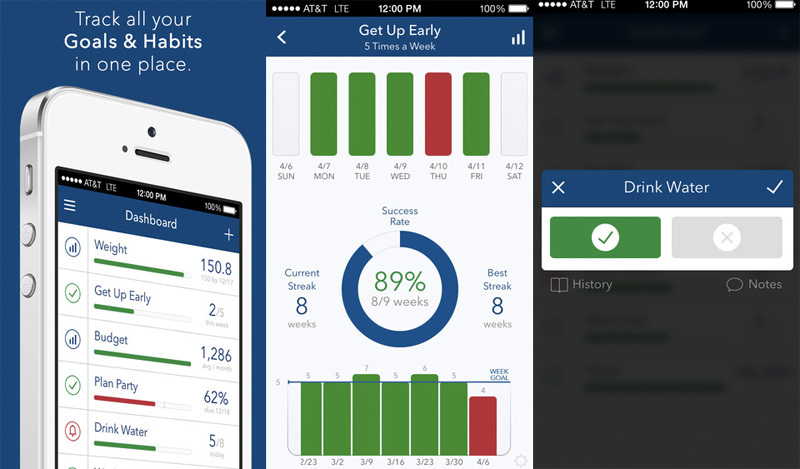 Here are SEVEN apps that you can use to track any habit that you are currently working on. You get to try the app out for free. For $3.99 you can unlock it to add an unlimited number of items (up from a limit of three). Simply add items to your “journal” and every day the app will ask you “yes” or “no.” Local notifications are used to remind you. 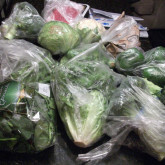 Some items like “late night snacks” are bad habits and for those it is better to mark no. You can also set up personalized entries that you mark whether yes or no is good. By creating this journal you can really focus in on what you need to work on. The trend tab allows you to see a graph of how you are doing. The setup guide is very helpful in getting up and running. 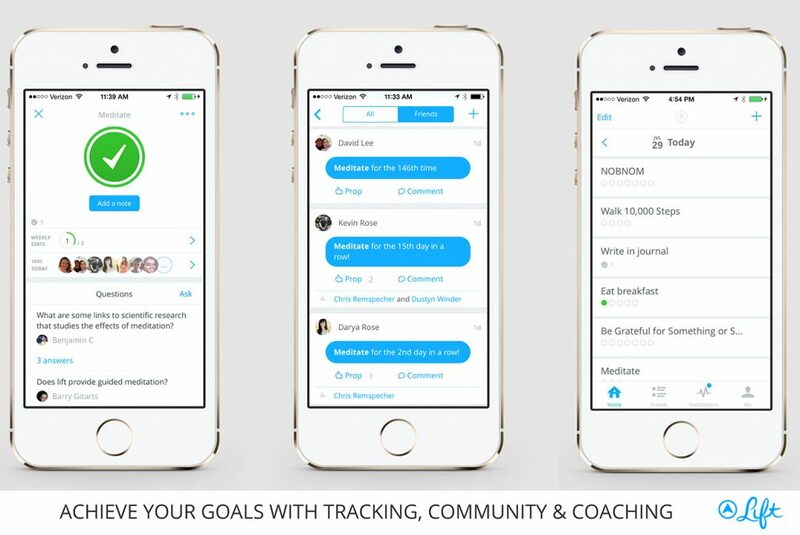 Way of Life is an essential app for anyone struggling getting on the right track. You can assign tags and descriptions to each “journal” or task in the app. I like that you can see all of your habits at a glance. You can view either a week chain or a month chain. The fun is that you can look at trends! YESSSS! Based on the good old principle of “not breaking a chain”, as popularized by Jerry Seinfeld’s approach to writing. You can add in the good habits you want to keep up (e.g. take fish oil every day). 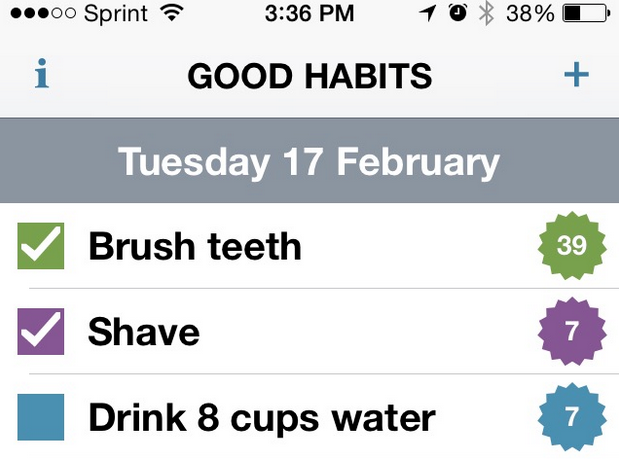 I like the ability of pausing the habits (as easy as swiping the habit to the right). It tracks the length of your chain (number in the star). On one hand, I like having a separate calendar with a separate chain of habits for each one. But there is no way to look at different habits together, like the Way of Life offers above. Aka Strides: Goals & Habits Tracker – SMART Goals, New Years Resolutions, Goal Tracker, Habit Tracker, Goal Setting & Quantified Self Tracking Tool with Reminders. Free 30-day trial, and then you are required to purchase a monthly or a yearly subscription. Way too sophisticated (for no particular reason). As can be seen from their description. This app is more of a social media tool. You can “follow” people who are working on the same habit, and they can “follow” you. I personally already have enough social media tools. And I don’t care to be “supported by a community” in my journey towards daily flossing or meditation. That could be just me though. This app attempts to game-ify behavioral change, so if you are into all things points, rewards, characters and levelling up, this may be for you. You will create a character, and set up habits/tasks, where checking them off, will allow you to earn points. You can even have pets (once you have enough points). My gaming days ended in the 1990s, so I found this to be too cutesy to use daily, but I can see how this can appeal to many! Check out how one blogger uses this app for writing. This app was recommended to me by a client, and ended up being my favorite. 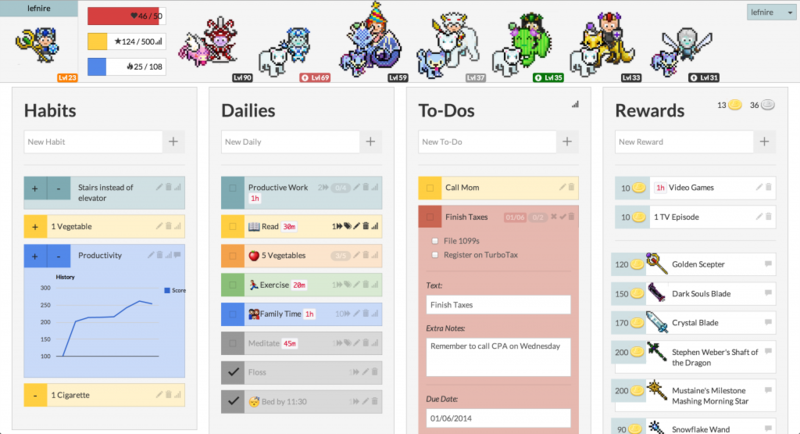 It has the simplest interface, and marking off habits is a breeze. I also loved that you could set up each habit as a Yes/No habit – e.g. Did you take your fish oil? – or, as a number habit – e.g. how many push-ups did I do? You can easily switch between daily, weekly and monthly view. 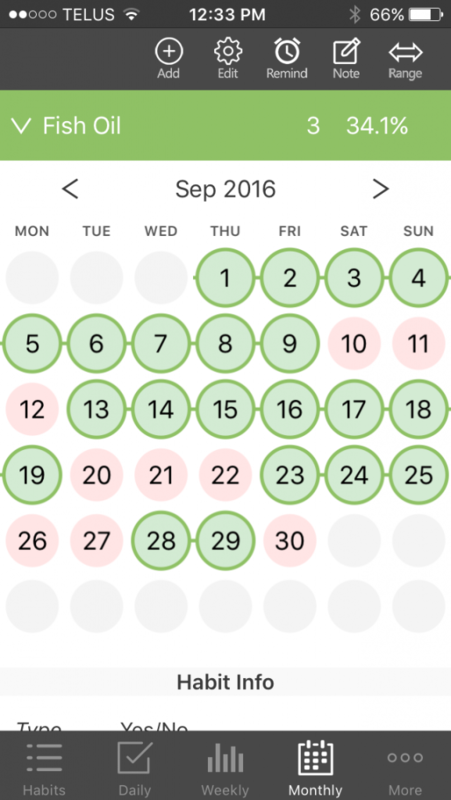 I loved the monthly view best, as you could see the unbroken chain of daily habits build up! So, technically, not a habit tracker! 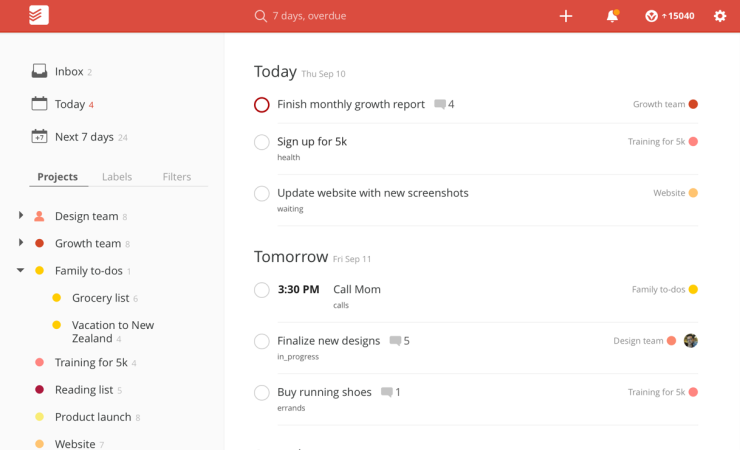 Todoist is the tool that I have ALREADY used to keep all of my tasks organized. 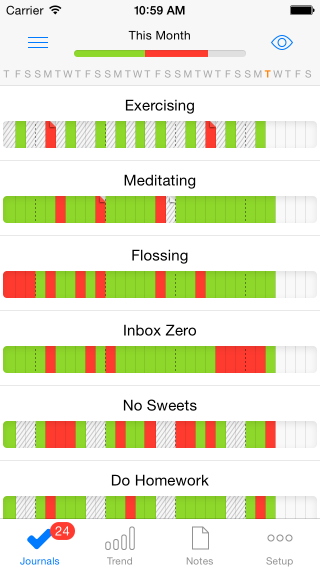 And this is the tool I decided to stick with for habit tracking also. I love that it’s multi-platform – kind of a must with the apps I have been using lately – so I can easily pull up the list of tasks while working on my desk computer or my laptop. This comes in handy with adding tasks, as typing on the keyboard is more convenient than on the phone, yet I have the entire list (synced live) with me on my smart phone. Todoist allows you to create projects with multiple tasks, and then nest projects onto each other (like file folders). 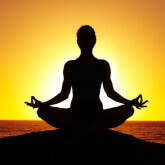 I use a project called “Healthy Habits” to list the daily habits like “meditate for 5 minutes” and “take fish oil”. The recurring date functionality allows you to set any task to be due at any recurring interval, so you could create a task called “flossing”, and have it pop up in your Today’s tasks every single day. After you check it off, it migrates to tomorrow. If you are bothered by daily habits cluttering your actual tasks for today, you can simply keep all the habits in one folder, and remember to do a quick run through every single day. Of course, the downside is no tracking. You can’t go back (easily) and determine how many days in a row you meditated or completed your workout – this is where dedicated apps really shine. Thus, using this tool may be more useful for habits where you do not really care about trends. Do I really care if I flossed for 27 days in a row or 29 days in a row? Not really. I just need something to remind me to do it on a daily basis, and have the satisfaction to check it off. 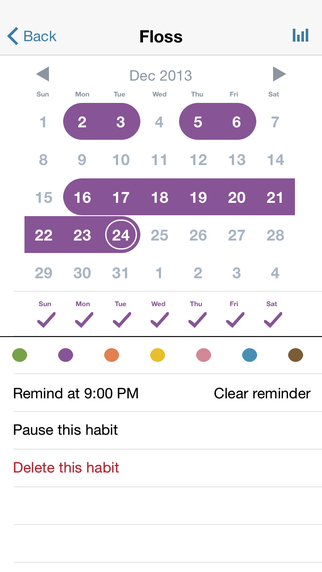 YOUR TURN: Do you have a favorite app for tracking habits? Have you used any of the apps I have described? What do you love/hate about them? Is there a perfect app out there (even if it doesn’t exist)? Let me know, and I may add it to this blog post! 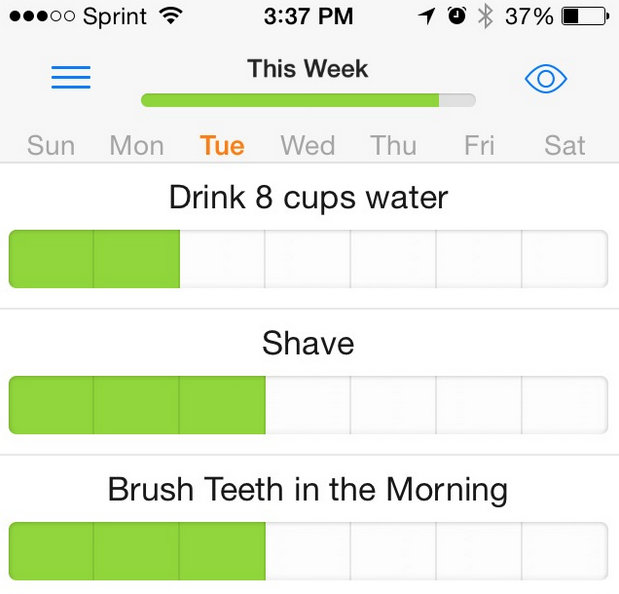 Want more on apps that help you track daily behaviors? Check out another great review here. I Have Meditated Every Day This Year – Impressed?